It’s been another busy week and I’m now right in the middle of packing my apartment to move next weekend. I love creating and food crafting, however a half-packed, chaotic space isn’t exactly inspiring. 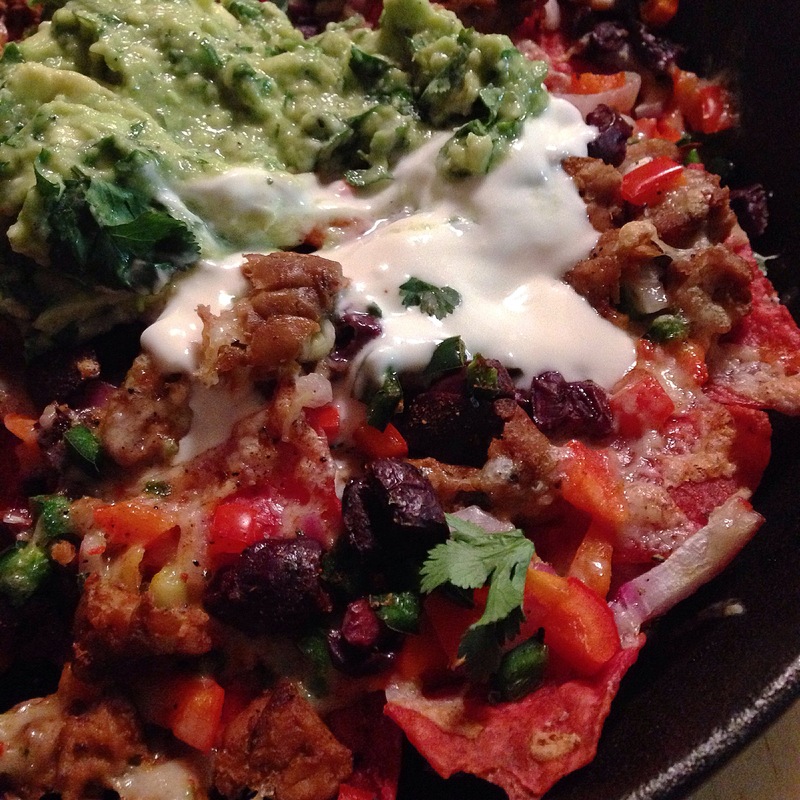 And then suddenly, on Friday night this popped into my mind – Skillet Nachos! Yessssss! *I always buy unsalted nacho chips for a couple of reasons: 1) I’d prefer to decide how much salt to use. 2) I’d prefer to decide what quality of salt to use. Heat skillet on medium-high heat and warm your tempeh or beans, or brown your meat, stir in about 2 tsp. taco spice and remove from the skillet. Cut up your ingredients: dice peppers and onions, slice olives, shred cheese. Cover the bottom of the skillet with nacho chips, and layer on olives, onions and peppers. I prefer the cheese on last, though I do set aside a tiny bit of each of the others to sprinkle on top along with a bit more taco spice and salt & pepper. Put skillet into the oven on low broil – WATCH CAREFULLY – it will take only about 5 minutes. Mash the avocado with the juice of half a lime and a few sprigs of chopped cilantro. Remove nachos from the oven once the cheese is bubbly. Scoop avocado into the centre along with some sour cream and garnish with cilantro and salt & pepper.